Eric Bischoff (AWA/WCW/WWE/TNA) is now available for appearances at Wrestling Events, Wrestling Conventions, Q & A and autograph appearances, and Seminars through Bill Behrens and SBI. He will continue to work with The Prince Marketing Group for appearances at ComicCons and other non-wrestling related events. Mr. Bischoff is a partner in BHE (Bischoff Hervey Entertainment). 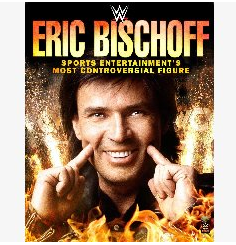 WWE will be releasing the DVD/Blu-Ray Eric Bischoff: Sports Entertainment's Most Controversial Figure in early June. He is based in Phoenix, AZ and Cody, WY.